I like Gamakatsu open eye siwash hooks. 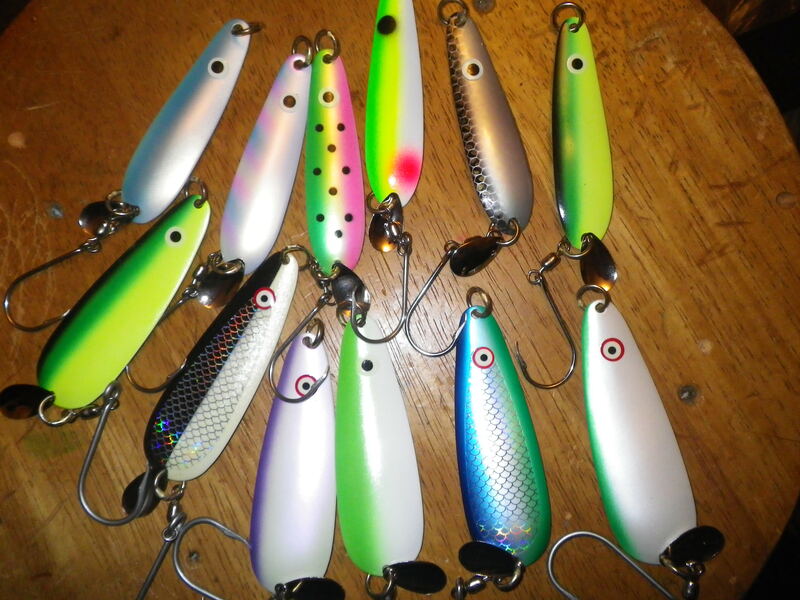 Size 4/0 for mag spoons, 3/0 for regular spoons, size 2/0 for smaller spoons (like super slims). If you need help learning how to sharpen hook, its available. Because the siwash hooks are of a larger diameter, open eyes are easier to install. Remove the treble and squeeze the eye shut over the split ring. A few spoons have soldered rings and open eyes are necessary, unless you wish to replaced the split ring also. I bought closed eyes. Any split ring that would not return to original shape was deemed weak and replaced. There are some guys I know that insist on soldering rings shut. Rings are tougher now. Some of them fish true skis out of the west end of the UP. Kind of a Seth Green on a 2x6 with a trip mechanism to carry the baits to the side. Not much give there. Big Lakers do over power snaps, rings and hooks. As to brand, Gamatsu is a good name in hooks. The last time I went on a spoon buying binge, a local tackle store had packaged bulk hooks very reasonable. I do not remember the brand, the owner said they were good. I have had no hook failure. I have not tangled with a 40 pound king either. I hope to get to Lake O this year and if I am blessed, my wife will land a 40. She does the driving and the winding. Bravo on a great post above. Lotta common sense. Siwash has worked for me both here in the midwest and the Pacific when I chased salmon outta Bodega Bay, CA. When I first started salmon fishing I had some blank spoons an old-timer gave me. I added admittedly cheap trebles. A couple of those cheap hooks got squashed pretty good by kings. Since then I have converted all my spoons to siwash. I think they are all Gamakatsu. Not sure the exact size. I just try to get the hook size to look appropriate for the size of the spoon. After I sharpen them, I bend the point off center a bit, so the point is not in the same plane as the hook shaft. Further, since spoons seem to ride with the colored side down, I have all the hooks attached so that the point is on top and the shaft on the bottom. My theory is that it is better to hook the fish in the upper jaw than the lower jaw. My 2 cents. If the only reason you want to switch hooks is because of the sharpening issue it's really not that hard. I'm trying to think why a treble would be more difficult for you and maybe it's because you are trying to sharpen what I would call the "inside" edge of the hook which really isn't necessary. I have always just used trebles on everything. Some days we land almost every fish that hooks up and some days some of them fall off but I am more than satisfied with the catch rate over the years. I personally have not felt the need to switch to single hooks. This is not intended to disparage or discourage anyone that uses or wants to try single hooks just sharing my experience with the trebles. Those spoons are 'west coast' single hooks, I guess. The majority of my singles have no swivel. I have on good third hand information that a fish hooked on a swiveled siwash hook is 'calmer'. I prefer the single hooks if only for that it takes less time to untangle/unsnare the net especially if you are lucky enough to be hitting doubles or triples.